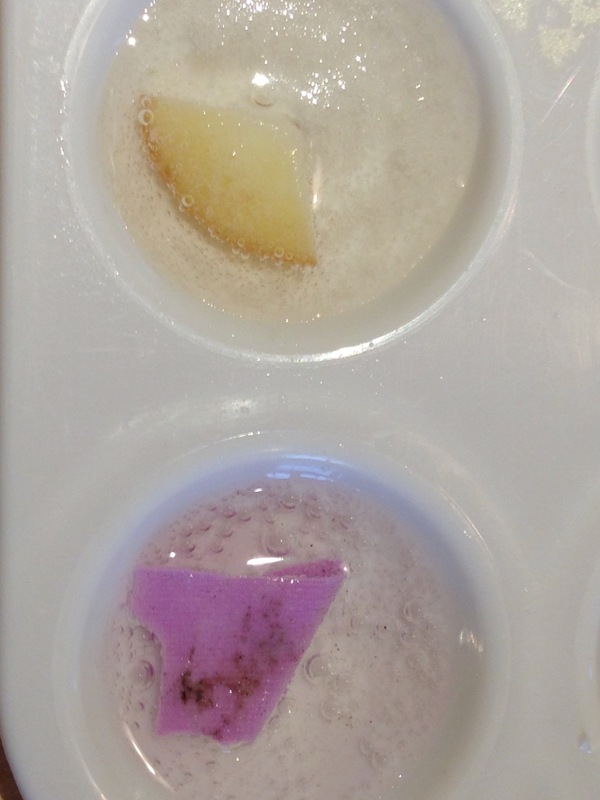 Test a variety of materials to see which ones can break down hydrogen peroxide, to make it bubble. 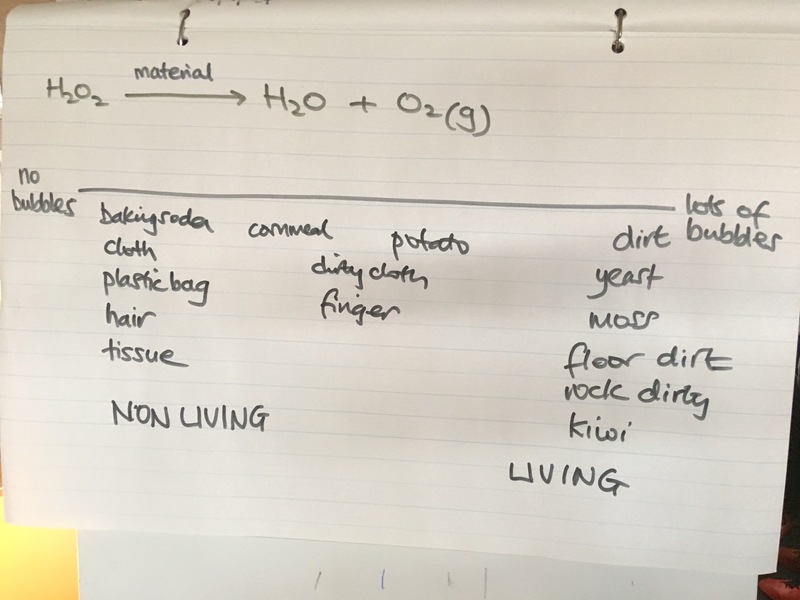 This activity investigates the chemistry of oxygen laundry bleach (show bottle). We'll look at a chemical reaction it undergoes, why it is environmentally safe, and the many ways that hydrogen peroxide is used in our world. Show the hydrogen peroxide molecule, H2O2. Tell students that molecule breaks down into water and a gas. Tell students they will figure out what this gas is. 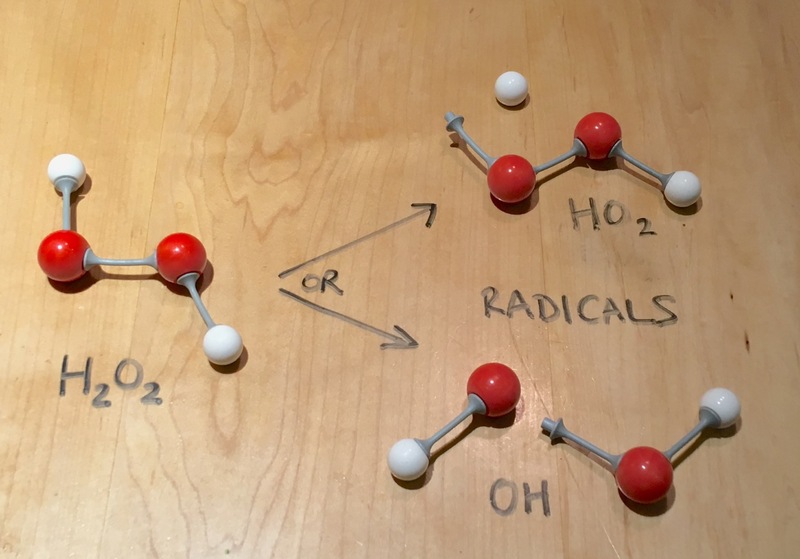 Ask students to build two H2O2 molecules. Then tell them that as these break apart they will make two new molecules, one of which is water. Ask students to break apart the hydrogen peroxide molecules and use the atoms and bonds to build two water molecules (two H2O). They should then use all the remaining atoms and bonds, and fill all the holes in the atoms, to build the other molecule that is made in the chemical reaction. Hence the chemical reaction when hydrogen peroxide breaks apart is 2H2O2 -> 2H2O + O2. Oxygen laundry bleach is environmentally safe because as it works, it breaks into only oxygen and water, which are in living things already. Whereas chlorine bleach (regular bleach) breaks down into molecules with chlorine in them, which are harmful to the environment. Oxygen bleach does not bleach coloured clothes to white if it is spilled on them, but it does remove dirt from clothes. The chemical reaction happens on its own slowly in the bottle of hydrogen peroxide, but is sped up by other materials. Hydrogen peroxide slowly breaks down on it’s own, but this decomposition is massively speed up with certain materials, called a catalyst. Students will test different materials for speeding up H2O2 decomposition. Discuss how, if the materials breaks hydrogen peroxide down, they will see oxygen gas forming, as bubbles. tissue or plastic bag or pieces of cloth (no bubbles). 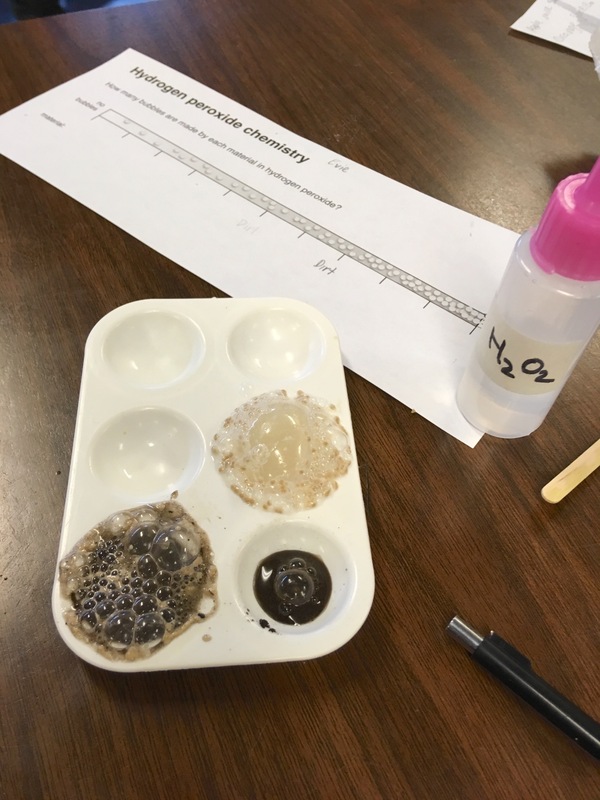 Set up tables where students can add hydrogen peroxide to their materials, to look for bubbles, and where they can rinse their trays once they have used all the wells. Hand out a tray and worksheet to each student. 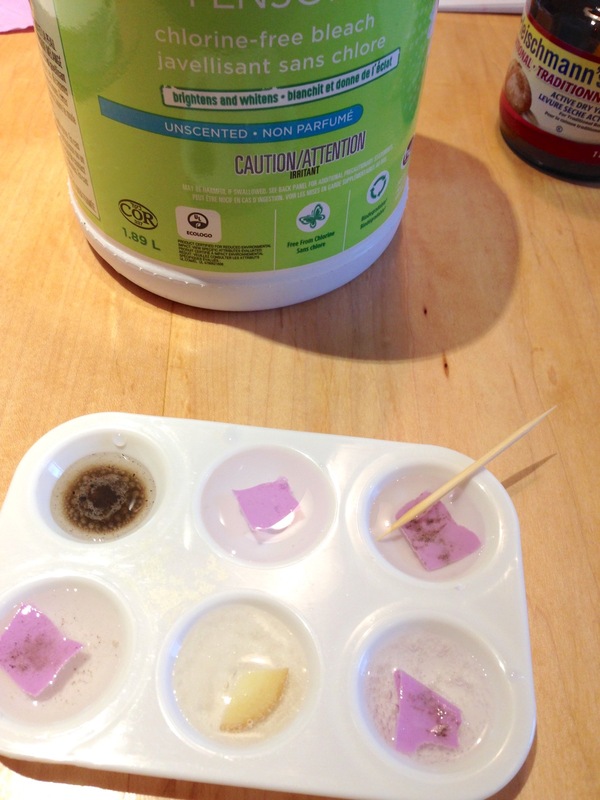 pencil or eraser shavings, hair, moss or rocks from outside, dip their own finger in hydrogen peroxide. Collect students results on the board. 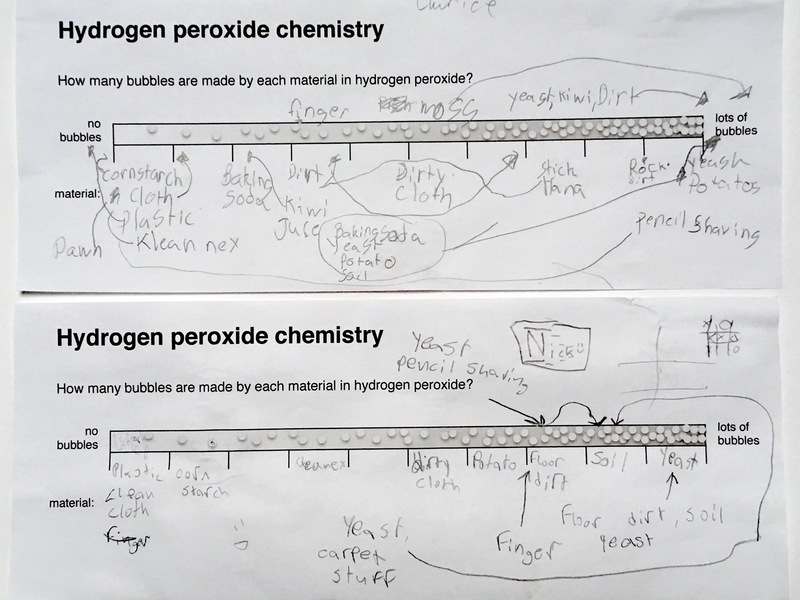 Ask students to figure out a pattern of what breaks down hydrogen peroxide and what does not. Help them arrive at living things produce more bubbles and non-living things do not (hair is not living, but is a dead protein strand exuded by a living cell in the scalp). Living things contain catalase, a molecule (an enzyme) that breaks down hydrogen peroxide into oxygen and water. The reason living things contain catalase is because living things produce hydrogen peroxide naturally all the time, through the chemical reactions happening in them. But hydrogen peroxide can be damaging to cells as it degrades into radicals before becoming the harmless oxygen and water. The radicals can attack DNA and proteins and membrane lipids, to kill cells. The catalase quickly converts hydrogen peroxide to oxygen and water, so the radicals do not hang around for too long to do damage. Hence anything with living cells in it bubbles with H2O2. The bombardier beetle uses hydrogen peroxide to make a hot irritating liquid that it squirts at predators. In separate chambers in its abdomen, the beetle stores H2O2 and catalase enzyme, as well as a quinone molecule. On demand, it mixes the hydrogen peroxide and catalase to make pressurized oxygen and water hot gases. Hydroxyquinone is also catalysed to quinone, an irritant. The mixture of hot gases and liquid are ejected at the intruder. Propellant in rockets and torpedoes. Hydrogen peroxide can be catalysed to gaseous oxygen and water, to be used as a propellant. Silver or platinum, which catalase the reaction are used to drive the reaction. Antiseptic: hydrogen peroxide is toxic to cells, as the radicals made in its breakdown interfere with cellular machinery, so it can be used as an antiseptic to kill bacteria. It does also kill living skin cells, but if not used repeatedly can be used to efficiently kill bacteria in a wound, before allowing healthy cells to grow back. Waste-water treatment processes to remove organic impurities. Crime scene blood detection. H2O2 radicals made as the haem in blood cells catalyses the breakdown of hydrogen peroxide. The radicals can make a glowing molecule (luminol). A crime scene in sprayed with H2O2 and luminol reveals where the blood is, even if it is at very low concentrations. Detectives use a UV light to see the glowing luminol. Hair bleach (Marilyn Munroe made the “bleach blonde” fashionable). H2O2 and melanin react, to make colourless melanin. Glow sticks: H2O2 in glass tube, mixes with a chemical outside. Releases energy again as light. Additional dyes make other coloured glow sticks. Tyee intermediates which had already done molecules models with the soda drink, it worked better to have the hydrogen peroxide chemical reaction as a demonstration. Other H2O2 catalysts: Decomposition is catalysed by various compounds, including most transition metals and their compounds e.g. manganese dioxide, silver, and platinum, Fe2+, Ti3+. Non-metallic catalysts include potassium iodide, which reacts particularly rapidly and forms the basis of the elephant toothpaste experiment.